We, the members of Commission on Concern No. 11, “Struggle of Teachers and Education Workers Against Imperialism and for a Better Future,” of the International League of Peoples Struggles (ILPS), join all the progressive and militant teachers, scholars, researchers, and education workers around the world in registering the strongest denunciation against the arrest of twenty-seven Turkish scholars over alleged “terror propaganda” after they signed a petition calling for an end to Turkey’s “deliberate massacre and deportation of Kurdish people”. The petition was a response to the Turkish military’s major counterinsurgency campaign against Kurdish militants in southeast Turkey. Aside from the arrest of the 27 Turkish scholars, the Turkish state headed by Recep Tayyip Erdoğan threatens to investigate all 1,128 Turkish signatories of the petition If convicted, they could face between one and five years in prison. According to The Guardian news, a female teacher who signed the petition complained: “My door at the university has been marked. Students wrote that they didn’t want terrorists as professors. They have also started a petition calling for me to be fired. At other universities signatories have [also] had their doors marked in red.” And many academic signatories had already gone into hiding in fear of state repression and of reprisals from extreme right wing student groups. The Erdogan government is known to be coddling the ISIS by allowing it to have training bases inside Turkey and unleash terrorism against the Kurdish people. This terrorist organization is financed by the US-puppet regimes in Turkey, Saudi Arabia and Qatar. As teachers, scholars, researchers, and educational workers we believe that a truly democratic state must at all times uphold academic freedom. Academic freedom is the foundation of healthy and vibrant democracy. No matter how academics and public intellectuals disagree against the state and criticize its policies, the state cannot suppress academic freedom. Allowing the state to target with impunity large numbers of intellectuals, teachers, and scholars simply because they express unpopular opinions vis-à-vis the state is extremely dangerous and reprehensible. The Erdogan regime’s war against teachers and academics completely unmasks the fascist character of the regime and exposes its claims to being democratic as a shameless lie. We, as academics and researchers from various countries, working outside Turkey, declare our solidarity with our fellow Turkish scholars and academics who are now subjected to state terrorism. Academics have the solemn duty to speak the truth to the powers that be no matter what dangers it entails. 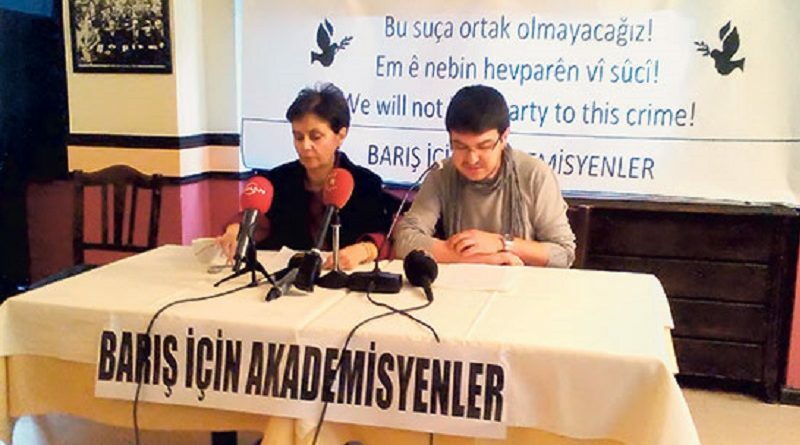 We urge all progressive academics, scholars, and educational workers around the world to unite and condemn the harassment of the Turkish scholars who are heroically calling for the end of Erdogan’s state terrorism against the Kurds.